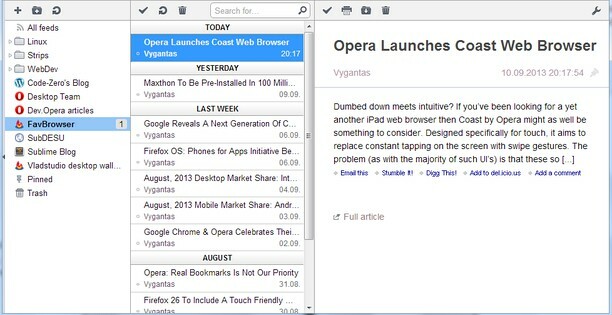 Smart RSS is an extension that clones (in a bit mutated way) RSS reader from Opera 12. If you have some problems with the extension don't mention it in a review but report an issue here or post a comment on my blog. I can not reply to your reviews! This extension uses IndexedDB to store your data. Quasimodo is a simple notifier which reminds you about sitting straight. Уж и "Оперу" переустанавливал и "Smart RSS"..
"Enable pannel toggle" should be spelt "panel". "SEMPTEMBER" should be spelt "SEPTEMBER". I can't seem to add new RSS feeds and there are no instructions that I can find. When the browser is smaller than full screen nothing in the titles panel or text panel sizes to fit browser window size. No word wrap in the text. The right end of the title lines and the text lines is not visible. I see this was reported a couple years ago so maybe not a high priority, but you can add me to the list of people who like to see it get fixed. Thx. I use RSS for the sole purpose of managing podcast subnscriptions. This extension does a magnificent job of managing my subscriptions, but with the fatal flaw that it won't display ANY of the download links, just the "full article" link, which, depending on the publisher, often doesn't lead to a download link elsewhere. In any event, the lack of download links ruins the point of having an RSS podcast feed in the first place. It's literally no good to me without them. Hi, development of this extension has been stopped for some time now and it is unlikely to change in future. I am sorry, but I just don't have the time or motivation to work on it any further. You will be probably better of with some other rss extensions. Hallo, leider ist es nur möglich die Refresh-Zeit bei jedem Link einzeln einzustellen. Bei über 70 links kann das sehr anstrengend werden. Ich wünsche mir eine Möglichkeit, die Refresh Zeit für alle einheitlich einstellen zu können. После одновления Оперы, перестало работать. вылетает и выключается приложение. На страничке пишет "Сбой загрузки страницы"
Me too.Thank you to modify how . The reading area went out of the screen in horizontal split mode. Vertical split works fine. And, please, pay attention to screen resolutions lesser than 1920x1080 - your extension shows vertical scrollbar for whole window. The icon should stop showing unread after the RSS panel has been opened and closed. Right now, it continues showing the unread orange icon giving the false impression that there are more new items. Hello. Thanks for great extension. Is it possible to add function that will not show duplicates in rss feed? I read different channels on Vimeo and get many duplicates in feed from 2 to 10. Suite de mon précédent message. Smart RSS can not handle this RSS feed so that the reader Opera 12 does perfectly. Smart RSS ne sait pas gérer ce flux RSS alors que le lecteur d'Opera 12 le fait parfaitement. Starting with Opera 31.0 the layout of the smart reader is bad: extra Scroll bars, a resizing with some feeds. Editing the main-compiled.css and restart Opera. I even tried coping the link directly to SmartRSS window, but no updates are coming. In the previous opera (if I remember well - version 12) everything worked perfectly. Thank you for your help in advance :). Ah, I am blind! :) I didn't click Show more and I didn't have RSS Detector installed :(. Still one request - to avoid dependencies, would it be possible to have those both being installed together? After 3 weeks of fine works, the RSS Smart page crashes continuously. All different pages crash, included extension manager page. Just click on page and it crashes. I've removed all the extensions except RSSsmart. What kind of info may help you to understand the problem ? What do you mean by crash. Does the whole browser crash? No other pages are open, just RSS Smart. Clean cache and cookies. No better. Well, in Options page of Smart RSS is a button that will clear all data form the extension. There is also optino to export your data (Smart EXPORT will export both feeds and their articles) so you can try to make a backup and then clear all the data if it helps. It seems that, during the feeds update, Smart RSS or Opera (? )loose control. 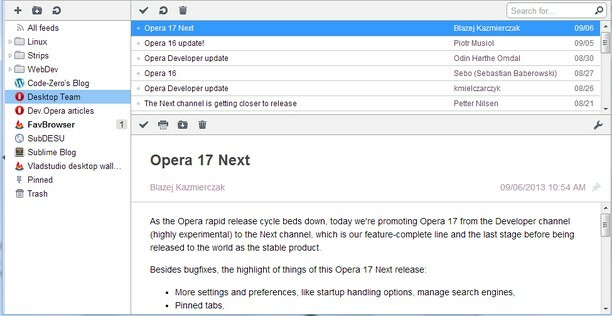 So any click on the page during update, crash the page of Smart RSS, but also any other Opera page opened. Do you plan to make an extension to the sidebar of the Opera? No, not at the moment. The development of this extension basically stopped a year ago and I'm still unsure whether I will start to improve it again. I miss option to mark rss entries as it was in Opera 12. For instance mark as "Funny", "To do" etc. It would be great also to create own marks (colour and name). Would it be possible to add this feature? sometimes i lose all my data including feeds and feed updates. where is the information saved and how can i back it up? In options page (openable form list of extensions or from the in-app settings popup on bottom), there are two export buttons. OPML will export onyl list of feeds, SMART -> everythinig is exported ... then you can import it again ... the data might get deleted if in the opera clear history dialog you check "clear cookies and other site data" or if your Opera profile gets corrupted. I can't delete a feed from the first column. How to do that? CTRL-Del doesn't work. Using OS X Yosemite on MacBook, no mouse. There is a context menu on right-click. I know this doesnt work well with Mac OS. You can set that the right click on touchpad should act as right-click of mouse and then the context menu should appear with right click of touchpad. I have a problem with automatic change of the sizes of the right section. Big headings are displayed not completely! http://zakupki .rosatom.ru/? node=currentorders&mode=order&action=rssfeed&ostate=P&ptype = & cust =. It will be great if you solve it. Hi, thanks for the report. What would be the ideal way to fix this? Should I allow the heading - if it's length is big enough - to take all the space of the right column? Or should I cut the text if it is too long and replace the missing part with three dots? Any other ideas? I offer the mixed option. The field for heading automatically increases to a half of section and if it isn't located, the rest of the text is replaced with three dots. I think it will be good. PgUp, PgDwn doesn't work any more at v25. I mean recognition of links in XML file. Thanks for the report. I will look into it! why does it show the link to the MP3 or MP4 file? "That's especially problematic if you have podcast feeds: Smart RSS unfortunately does not support Opera's great "Download" extraction funtion for audio files (I strongly recommend that if possible), so you always have to visit the article for the audio :-("
Support for podcast is in my todo list. ok. Is there an AddOn for Podcasts? It would be good to keep old read items using Import/Export. Or chuse what to export/import. Your developers build stop working today as previous extension. Can you help me? Please. Ok, this sounds a bit more serious, but we should be able to fix it. Go please to the list of extensions (CTRL+SHIFT+E), and switch to developer mode (there should be button in top right corner), then find the "Smart RSS" dev. build in the list and there should be a blue text "index.html". If you click on it, a popup should appear with developer tools. In developer tools there are several sections and you can switch between them by selecting different tabs in top part of the popup. The last one is called "Console". Click on the "Console" tab, copy all the text from the console and post it here. Thanks, that alone should help a lot. Sometimes on the same line but aligned to the right is a file name and a number. Do you see anything like that there? Great to hear it. Thanks. Hi, I finally managed to find some productive time and hopefully fix the bug you have. Try this build http://smartrss.martinkadlec.eu/smartrss.2014-09-01.1.nex (if you drag it into the extension tab it should automatically update the last dev. build). Unfortunately, I know only what went wrong but I don't know why so there still might be some other parts of the problem. Let me know if this build helps. Does not work with rdf. For example: http://www.bluesnews.com/ Opera 12 works fine. The Smart RSS tab don't show when I click no the button. The button is filling from gray to dark gray and nothing happens. Please help. Yesterday everything was working. The dev. build will install as separate extension. Let me know if you can do a SMART export from the extension's option page so that you can import it to the dev build. Will you update the extension to fix this issue? Did you try the dev. build? Did it help? Hello. Yes, I've installed dev build and import my rss feeds, thanks. But a bit sad, cause I had many unread feeds in previous version and can't get them. But thanks a lot for working one. Wait, did you do an OPML or SMART export/import? OPML exports just the feeds, but the SMART import should export all the articles including their state (read/unread). Hello. Yes, I did smart and it only imported my feeds and refresh them. Hm, it might be sidefect of the problem with 2.0.5, I'll try to speed up the update. Sorry for the inconvenience! No longer works in opera 25 for Linux 64 - Looking forward to an update. Was working pretty well although some download links that show up in opera 12 aren't present in Smart RSS. Hi, can you describe how it "doesn't work"? The Smart RSS tab won't show u when you click no the button? No new articles are downloaded? Content of articles isn't displayed? ... I tested the extension on 025 and it seems to work, so I'll need some more information from you. Also If you remember what feed/articles did not work correctly (or as in O12) it would be great if you could point them out to me. Is there some specific action you do when it crashes? Is the Smart RSS tab opened or is the extension just running in background? Does it crash when you disable all other extensions? Can you please make different background colours for odd and even rows in the list (like in OP12)? A small but very useful improvement. Also clicking-on-column-header-to-change-sorting-by feature would be nice. Ctrl+A than D - works. There is a difference between the "trash" icon in middle column and in the left column. The icon in middle column will delete all selected, the one in left column will delete only the article in the left column. Is there a way to manually sort the feeds..? Actually, you could edit the titles and add some prefix to make them sort as you want. What is your use case for manual sorting? Thanks for responding, sorry so late in return. I have begun to edit the titles of feeds that I like to read first. Not all my RSS are equal in interest or frequency of reading. Select All, than mark selected as Read don't works correctly. Today, Smart RSS was updated from v1.0.4 to v2.0.5. Can you check if the problem remains and if it does can you describe what it does and what is your expected behavior? Switch to all feeds, mark random feed as Unread. Press Ctrl+A than press "Mark as read" button. Only one item is begin marked as read. I still can not reproduce the problem :( ... Can you perhaps do an SMART export and upload it somewhere so I can test it with your feeds? So it is a problem with RSS Detector? If you add it viwith the "+ Add feed" button directly in smart rss tab, in the 11-04.1 version, does it work? Hi, does the problem still remain? On Win7 64. Some favicons don't load. One example is the CloudFlare Blog feed (http://blog.cloudflare.com/rss.xml). The favicon for it loads fine in Op12 mail, but not in Op17 SmartRSS. Not a big deal, but it is odd how it works on most icons but not some. Ah OK! At least I understand what's happening then. Thanks for the timely response!